There are a number of reasons, but they mostly boiled down to accessibility, interest, and sheer costs. By the time I got into the genre, materials were hard to find, interested parties were difficult to maintain due to death and grit, and thanks to the pricing of Warhammer materials, I was priced out of the biggest name in the genre. With a number of newer games coming out that rely on darkness, grit, horror, and more, I’ve been changing this experience of mine, and with the help of Daniel Fox, I now have a copy of Zweihänder: Grim and Perilous RPG (Zweihänder), in my hands and waiting for a review. With a new edition of Warhammer Fantasy Roleplay (WFRP) coming up to bring us a world of grimdark insanity, how does this indie retroclone stack up two years after it’s successful Kickstarter? Grab your preferred weapon, find your ratcatcher, and pray to whatever gods you believe in, because there’s a journey to be had. Writer’s Disclaimer: The author of the book, Daniel Fox, provided a copy of the book for review purposes at no charge. This has no influence over the grading or criticism found within this review. Zweihänder is a “retroclone” and spiritual successor of WFRP, pulling from the first two editions to create something both familiar and new. The game banks on gritty realism and what some call a “pathetic aesthetic,” showcasing the fragility of humanity against horrors both mundane and supernature. The game utilizes a percentage mechanic similar to WFRP, as well as overall aesthetics, but is specifically designed to handle “darker” settings in medieval and renaissance eras, with specific (and popular) examples including The Witcher and A Song of Ice and Fire. I joke and say that Zweihänder is an apt name for this book, because like the sword it is named after, you will need both hands to properly wield this book, whether as a weapon or as a learning tool. Yes, this book is MASSIVE. The name is rather apropos. The print-on-demand hardcover copy I was sent weighs in at 690 pages with thirteen chapters (with a prologue and appendix), making this a massive tome. The PDF versions, on the other hand, are still rather beefy in the 100-320 MB range (based on DPI; either 150 or 300), but at least can be wielded one-handed depending on your device. Within the book, we are given a quick and easy to grok roll mechanic (d%, mods in 10% increments), various plot seeds, setting notes, an adventure, and 118 professions (with 72 being available to starting characters). Everything you need to run the game with a properly grimdark setting is available within these pages. Everything you need, including directions! While I am not counting it toward the grading for the book, I have to say that Daniel is what I would consider “Good People.” As it tends to be a trend within previous reviews regarding products from other indie devs, he’s always been approachable, willing to answer questions, and actually loves the people within this fandom. Any developer that stands by their creation like this absolutely deserves my respect, which is why I keep throwing money at Evil Hat and why I’m starting to throw money at a few other devs like Third Eye Games. While there may be some complaints about the sheer size of the book, I have to admit that you are getting your money’s worth here. If I were to purchase a brand new copy of WFRP4e, I would end up paying about $60 before eating the costs to ship it from the UK. The same goes with some books that are solely black and white; picking up a copy of Maelstrom Domesday directly from Arion Games will run you a good $20 for a softcover before you worry about the export and shipping costs from the UK, and that’s barely even a third of the size. In the end, you aren’t paying much more than you would on a brand new release for a major, full-color, RPG that runs half the number of pages and isn’t as in depth. Honestly, how many medieval-themed core rulebooks give you a 160 page bestiary? Beasts in gas masks? Where do I sign up?! Shut up and take my money! Even the PDF is affordable; purchasing a copy of Zweihänder will run you about $10, but if you were to purchase the Genesys RPG published by Fantasy Flight, you’re paying $20. Price point perk goes right to Zweihänder. One pet peeve of mine with most modern RPGs is the glossy coating on pages. While it helps with the durability, it is a royal pain when reading in certain lighting due to reflections and glares. This book, when purchased as a Print on Demand from DriveThruRPG, gives us the kind of paper I’m used to seeing with older game books that makes reading more enjoyable and less of a chore. This is more of a personal thing and is probably more of a credit to DriveThruRPG, but this is worth noting for anyone who’s had the same issues as I have. It’s a wonderful view, really. Reading through Zweihänder, one thing that pops out is the writing. It flows along smoothly and is easy to understand, from the advanced concepts to even the simplest parts of character creation. I’m also a big fan of how “open” this game is; there’s clear notes that this isn’t a boy’s club like we are used to seeing, especially with the inclusiveness of alternative races and alternative gender identities for PCs. Unlike most fantasy RPGs, Zweihänder has a number of ways of making characters unique. For example, at character creation, every character has a randomly generated “Racial Trait”, which means that an entire party of the same race will all have something different. For example, you could have a party of three Dwarves, and only one of them can drink everyone under the table and still fight just as well (“Consume Alcohol”), while only one has the ability to see in the dark (“Cavesight”), and the last could be immune to mind-altering magic (“Stoneheaded”). In this way, every character is coming out of the gate as something different than the others instead of what we see in games like D&D in which all characters from the same race will be walking around with the same benefits. One snag I face with many fantasy RPGs is the purely linear progression mechanics that are built into the game. Are you playing a fighter? Well, you get these bonuses to your combat skills. Do you want to pick up another class? Well, here’s why it’s a bad idea, but here’s how you get to dabble. Ranger? Druid? Fighter? What’s the goal with all of the multi-classing? In Zweihänder, you are given a bit more freedom. After you get your “starting” Profession (randomly generated according to the rules as written), you use your “advances” to improve upon the list of capabilities within the Profession. Once you complete the list, you are free to move on to another Profession. Technically, any Profession, regardless of where you started, so long as you meet the minimum requirements and get GM approval (otherwise, it’s within your Archetype only; blah). As a limiter, you only get three Professions over the course of your character, which is an interesting change compared to Warhammer (a game you can theoretically continuously change after meeting the minimum requirements). With this in mind, I can start off as a lowly Ratcatcher and, after some adventures, decide to become a Sellsword (another basic Profession) instead, using a combination of animal handling and martial prowess to build my reputation while also surviving challenging tasks. Due to the storyline, I could then shift into a Grail Knight (an advanced Profession) as I answer a higher calling. It’s a fun way to handle things, and with how the numbers are handled, I don’t feel like I am horribly penalized for doing so. In fact, this is even PROMOTED in a sidebar, and I feel that more games need this. Progression with the plot. I think more gamers need this reminder. Which brings us to the mechanic, which I feel is easy to grok and a bit more user-friendly than the various d% games that have come before it. For starters, nearly every bonus is simple to track and is not a bunch of “Whatever gives the most pluses.” The tens place of each stat is the bonus for that stat, which will influence things like damage, overall resistances/health, and movement. Purchasing a bonus as an Advancement goes right to the bonus and not to the general rating, making this REALLY easy to monitor. Additionally, having a skill rating just adds +10 to the roll, and other mods either reduce wound penalties (also in 10s), add more bonuses (again, usually in +10 increments) or they give the ability to “flip” the results to success or failure (depending on circumstances). That’s it, and it’s wonderfully simple in comparison to the clunky +/- % based on every single thing that I’ve seen in other games. While I love the amount of detail in the book and the sheer cost analysis, this book is a beast to carry around. My Messenger Bag of Holding is about half full when carrying this book around, and it’s quite heavy in general. While it is lovely and convenient to have a print copy, it’s just so bulky that it becomes almost impractical to carry around unless you are going to game day. Like the games that have inspired it, and the games that came out during that generation of games, there’s a lot of crunchiness and randomness going on here. I’m not even entirely certain if that’s the best way to describe it, honestly. I guess we could say there’s plenty of numbers here, including derived stats, there’s plenty of ways in which your fate is in the hands of your dice, and a plethora ways that these numbers get influenced over the course of a game. Everything from your stats to your racial bonus to your starting profession are randomly generated, which can be frustrating if you have a specific character idea in mind or want to balance the group. The game also has an Order/Chaos mechanic that is checked at the end of each session (similar to tracking corruption of the Dark Side in FFG’s Force and Destiny line), which is another layer of random that can really mess with your character. This may not be a turnoff to some, but for me (especially after getting through things like Celtic Legends, Maelstrom, and talking to friends about other retro clones/OSR titles), it’s not something I am a big fan of. I hope you have a lot of parchment and ink, because you’ll probably need it. While the game offers a few notes for alternative rules, and the mechanics are both easy to grok and hack, some of the rules as written may be off putting to some players. The “classic” stat approach of random roll and assign down the line can be a bit frustrating, but I feel that some players may get frustrated at being “locked in” to a roll once they know the difficulty of it. As an example, if a player wants to jump across a rooftop, once they know the difficulty, they must take that action; there’s no leeway here with the rules as written (and therefore players technically can’t gauge things before acting). Sure, it adds to the grim and perilous feel, but I have a feeling a number of groups will end up coming up with more house rules than not as they read through this book and adjust the mechanics (from character creation to progression to general play) to make it more fitting for their own groups. For those who are new to the role of GM, this game is technically not ready to run out of the box, and in many ways, it’s not entirely newbie friendly. While we are presented with all of the rules we’ll need to run a dark medieval game in an easy-to-follow format, there’s a bit of required work for the GM outside of reading the rulebook (a Herculean task if you are on a deadline), and that is creating a setting. While the book includes an adventure and provides four “campaign setting” seeds, you won’t have everything required to sit down and start playing anything long term due to the lack of a primary setting. Sure, anyone who is familiar with some of the referenced titles (Warhammer, the Witcher, etc) should be able to wing something, but for a true novice, this isn’t a very welcoming title. At the end of the day, the biggest disadvantage to Zweihänder is that it is a product of the 80s brought into today’s world of gaming. While there are a number of updates that make it a playable and enjoyable game (seriously, it consolidates everything from each previous edition of Warhammer), it absolutely showcases a number of issues from that era of game design while not adding much to the modern scene of the game industry. Sure, it’s a solid game, but it’s not an original solid game. Rather, I feel that it is a game the pulled what was good from predecessors and turned it into something that would keep older grognards happy while drawing in new players. I hate to say it, but when compared to other games, I almost want to say it’s “uninspired.” This tends to be a problem with OSR titles and retroclones, but seeing so much clearly reskinned makes me feel this way. One of the biggest middle-ground points of this game is simple how niche it is. Everything from the art to the mechanic directs us to the feeling of grimdark fantasy, with room for little else. While it’s great to see that the game has that degree of laser-focus, it can leave a bit to be desired for anyone who wants to tweak the game into something else that isn’t as grim or as dark. I’m not saying that it needs to be, but rather I am saying that if you aren’t that into grimdark, you will find large parts of this book useless, but other parts will still be worth reading or using elsewhere (like the aforementioned charts for random generation). I’ll be honest here, I have a love/hate relationship with Professions. I felt that way when a friend introduced me to Warhammer Fantasy back in my college days, and I still feel that way now, especially when over one hundred pages are dedicated to the various professions that can be acquired. Considering you only get three of them over the course of your character’s lifespan, it can be a bit overbearing and slightly frustrating. That said, it does mean that there’s a ton of versatility here. You can almost literally play the character you want to play (like the aforementioned Ratcatcher that moves on to becoming a Sellsword and eventually becomes a Grail Knight), and there are very few reasons for players to all play the same Profession (unlike D&D, in which you can usually run into groups unwittingly all playing the same class when they don’t coordinate). It’s nice that there are options, but I worry that there may be too many, especially with Main Gauche coming out soon to add even more to this already impressive list. I know I harp on this with every book I pick up, but I feel that the artwork falls into middle ground territory here. The artwork in the book is black and white, with heavy emphasis on being dark. This element is extraordinarily fitting, as everything from the full-page chapter art down to the quarter-page art for the Professions match this theme and trend. Like the Hedge Knight. I really love how they handled armor in this. Sadly, the art quality leaves something to be desired. It’s a fun theme, and some of the art feels like it is a nod to both other grimdark lines and medieval manuscripts, but it’s not consistent. Many of the “scene” art feels unbalanced with slightly off proportions, while others have a decent flow. Some of the art for the Professions are rather detailed down to individual (and properly proportioned) buttons, while others just feel like the details were not important. 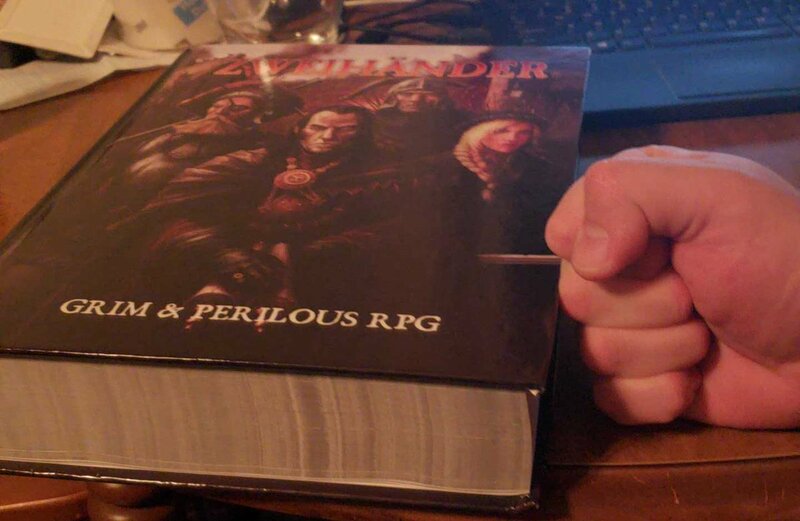 By the end of this massive tome, I would have to say that Zweihänder has secured itself a steady 3.5 buns. The game is absolutely an OSR Retroclone that brings classic grimdark to a modern audience in an extraordinarily approachable, updated, and more importantly, affordable format. It really is everything you need for proper grimdark adventures without needing to reskin an already existing setting, and with Dark Astral and the upcoming Main Gauche, you really have everything you could ever want for deadly adventures that you can hack into whatever you’d like. In all honesty, I’m looking forward to the day I have the time and properly dedicated group to give this a proper spin. Sadly, the game is an OSR Retroclone, and because of that, the rules as written contains a number of the issues of that generation of tabletop games. While some of these things create a useful tool for GMs (like multiple tables for characteristics), it does make the game less accessible than lightweight games like Fate, Dungeon World, or even Cortex. I also find myself struggling to consider suggesting it to new GMs, as it is rather intensive and intimidating to get started. If you are looking for a solid game to scratch your itch for for grim, brutal, and dark roleplaying, then you absolutely cannot go wrong with Zweihänder. If you want something lightweight and happy that you can pick up to run in a few hours, you’ll want to give this a pass. Zweihänder: Grim and Perilous Roleplaying is available on DriveThruRPG as a PDF for $9.99 or via Print-On-Demand for $49.99 (and includes PDF) as of this writing. The first chapbook, Dark Astral, is also available on DriveThruRPG as a PDF for $3.99 with Print-On-Demand options beginning at $4.99. Anthony, better known as LibrariaNPC, wears many hats: librarian, gamemaster, playtester, NPC, and our Editor-In-Chief. You can support his work here.